Full Description: Ref: ID4132 This is a great opportunity! 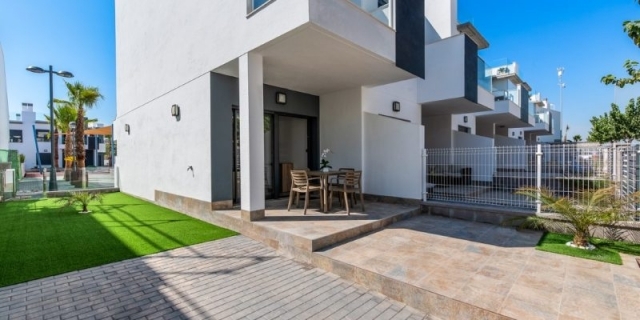 New build bungalow apartments from 42m2 located in Pilar de La Horadada, Costa Blanca composed of living room plus 1 bathroom available on ground floor with garden or top floor with terrace and solarium. The kitchen is nicely furnished, the bathroom is also furnished with modern design and the interior space of the bungalow is generous. The property also comes with reinforced concrete structure, exterior aluminium shutters high end and dark grey, glass thermal-acoustic safety, single-lever faucets in toilets and showers, kitchen and bathrooms lined with high-end ceramic. interior woodwork quality wood, painted white, stoneware pavements outside high quality porch and deck, pre installation TV, internet and alarm. This great opportunity! New build bungalow has access to communal areas, communal gardens and parking. Prices now start from only 84.900 EUR Larger units available Pilar de la Horadada is located 3km inland from the beach at El Mojon and ideally located close to the safe sandy beaches of the Mar Menor. The region is largely agricultural; surrounded by market gardens, orchards, citrus groves and pastoral farms. The town is close to a coastline of fine sand and clear water beaches, interspersed by attractive inlets, all offering a full range of services. The beach at Mil Palmeras is ideal for sailing enthusiasts, linking up with the Rincón and Puerto inlets; the latter with a promenade that comes alive on hot summer nights. Las Villas, the beach behind Torre Horadada marina, is the longest beach followed by a smaller beach at La Mojón, which reaches the border with Murcia. A full range of water sports is available on the coast here. The town has excellent sports facilities for athletics and football and horse riding facilities are available nearby. The centre of Pilar de la Horadada is a shopper’s paradise with many boutiques, pastry shops, banks and gaming salons lining the main Calle Mayor. Pilar de la Horadada enjoys a typical Mediterranean climate, with cool sea breezes in summer and protection by surrounding mountains against the cold North winds in winter. The area averages nearly 3,000 hours of sunshine each year and the average temperature easily exceeds 20 degrees. In 1986 the World Health Organisation recommended the climate of the area as one of the most equitable in the world – neither too hot in the summer nor too cold in the winter. On average it can boast 325 sunny days each year making it an ideal all year round destination.